Objective: Antipsychotic medications are the frontline treatment for the most psychotic disorders. The aim of this study is to compare the onset of action of the first and second generation antipsychotics and the rate of their side-effects in the treatment of acute psychosis. Methods: In a double-blind, controlled clinical trial, 40 acute psychotic patients were randomly allocated in four groups and treated with each of the four antipsychotics: olanzapine, risperidone, haloperidol or thiothixene. The onset of action of each drug was assessed by the Positive and Negative Symptoms Scale. The data were analyzed by Wilcoxon (Gehan) survival and Log Rank analysis, using SPSS version 20.0. Findings: Initial response was observed in 97.5% (N = 39) of subjects during 2 weeks of intervention. The mean time to the first response was 6.15 ± 2.9 days and this was significantly shorter for risperidone than others. The most common side-effects were sedation and drug induced Parkinsonism. Conclusion: Risperidone represented shorter onset of action for the treatment of acute psychotic symptoms compared with olanzapine, haloperidol and thiothixene. In this study we compared the onset of action and the rate of side-effects of four different FGAs and SGAs in the treatment of acute psychotic episode. Subjects were chosen from admitted patients in the psychiatric ward of Noor Hospital (Isfahan, Iran). All subjects met the following inclusion criteria: (1) 15-60 years aged; (2) Onset of psychotic symptoms (delusion, hallucination, thought disorder or bizarre behavior) during recent 30 days; (3) current diagnosis of schizophrenia, schizoaffective disorder, schizophreniform disorder, substance induced psychotic disorder, psychotic disorder due to general medical condition or psychotic disorder non-otherwise specified, according to Diagnostic and Statistical Manual of Mental Disorders-IV-Text Revision criteria; (4) a score of at least four on at least two of the positive subscales, or at least five on at least one of the positive subscales (P1-P6) of the Positive and Negative Symptoms Scale (PANSS);  (5) Written informed consent. Subjects also met none of the following exclusion criteria: (1) Any serious medical condition that may interfere with safe study participation; (2) receiving any antipsychotic treatment for more than 7 days during the last 30 days; (3) receiving any long acting antipsychotic during last 3 months; (4) incidence of acute psychosis in the context of mood disorders; (5) pregnancy or nursing in women; (6) history of severe drug adverse reaction; (7) simultaneous use of anticonvulsants, antidepressants or mood stabilizer drugs. This study is a randomized, double-blind, controlled clinical trial with four active medication conditions, carried out on year 2013 and has been registered on Iranian Registry of Clinical Trials with identifier Number IRCT201305177841N3. The study followed the Declaration of Helsinki on Biomedical Research Involving Human Subjects and was approved by the Ethics Committee of the Isfahan University of Medical Sciences. All the participants provided written informed consent. The eligible subjects were randomly assigned to olanzapine, risperidone, haloperidol and thiothixene groups. The intervention duration last 2 weeks and the drugs administrated with doses equivalent to 300 mg of drug chlorpromazine;  i.e., 4 mg of risperidone, 10 mg of olanzapine, 15 mg of thiothixine and 5 mg of haloperidol. Conventional dose of an anticholinergic drug (Biperiden) prescribed for subjects <45 years old, with previous extrapyramidal side effects, or incidence of extrapyramidal side effects (acute dystonia, Parkinsonism More Details, akathisia) during study. We used positive subscales of PANSS (P1-P6; Delusion, Conceptual disorganization, hallucinatory behavior, excitement, grandiosity and suspiciousness/persecution) for assessing the onset of action of the drugs. PANSS is a standard measure for assessing symptoms of schizophrenia and its reliability is 0.73-0.83. The translation and back-translation method was used to make the Persian translation of PANSS valid. PANSS was translated by two psychiatrists to Persian and then two other bilingual psychiatrists translated the same text to first language. Translated texts were evaluated by the translation team for final decision. The subjects were assessed with 2 days intervals. In the subsequent assessments, score of at least three in all of positive subscales or decline of equal or more than 30% in total score of positive subscales (P1-P6) accounted as the determinant of the onset of action of the drugs. The complete blood count, electrocardiography, aspartate transaminase, alanine transaminase, fasting blood sugar, blood pressure, body weight and body mass index of the subjects were assessed at the first screening and the last visits. In each subsequent visit, we also assessed drug side-effects, by using the Abnormal Involuntary Movement Scale-National Institute of Mental Health scale for EPS;  and checking for the other side-effects such as sedation, blurry vision, dry mouth, constipation, urine retention and rash. Randomization was generated by a third party physician using tables of random numbers. Care providers and physician assessing outcomes were blinded for each other works and results. We used Wilcoxon (Gehan) survival analysis and Log Rank analysis for comparing mean time to first response in four treatment groups. Paired-samples t-test was used for measuring decline in score of PANSS and Pair wise comparison with Fisher exact test was performed for comparing the rate of different side-effects. All analyzes were performed using Statistical Package for the Social Sciences version 20.0 (SPSS Inc., Chicago, Illinois, USA) and a P < 0.05 was considered as statistically significant for all analyses. A total of 68 patients screened and 41 met all inclusion and no exclusion criteria, which allocated randomly into the four intervention groups [Figure 1]. The mean age of participants was 31.65 years (range, 22-43 years). The demographic and clinical features of the sample are tabulated in [Table 1]. There were no statistically significant differences on demographics or disorders type between intervention groups. All of the participants received anticholinergic drug (Biperiden 2 mg 3 times/daily). Clinical response was observed in 97.5% (N = 39) of subjects within 2-weeks study and only one subject (in olanzapine group) did not respond after 14 days. The total mean time to first response was 6.15 ± 2.9 days. The mean time to first response was significantly different between four groups (P < 0.003) [Figure 2] and [Table 2]. Log Rank analysis showed that the mean time to first response in risperidone group was signiﬁcantly <3 other groups; although was not significantly different between these three groups [Table 3]. Paired t-test showed significant decline in score of PANSS subscales (P1-P6) in four groups. The comparison of mean percentage of decline was not significantly different in P1 (Delusion), P2 (Conceptual Disorganization), P3 (Hallucinatory Behavior), P5 (Grandiosity), and P6 (Suspiciousness/Persecution) between four groups. 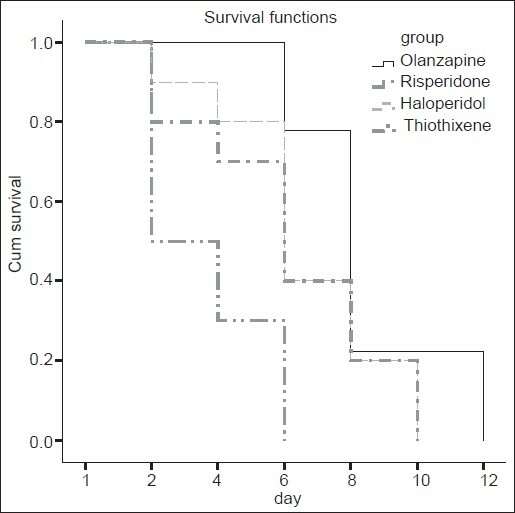 In P4 (Excitement), the mean percentage of decline in risperidone group was less than haloperidol and thiothixene groups significantly (P = 0.02). The most frequent side effects were sedation (9 cases) and drug induced Parkinsonism (8 cases). Patients with EPS (Parkinsonism, Akathisia, Acute dystonia). Side-effects that were elicited at any time during the trial in all subjects are listed in [Table 4]. Between-group comparisons of maximal EPS demonstrated more frequent symptoms in the haloperidol group (P = 0.001). Furthermore in risperidone group, EPS were significantly more than olanzapine and thiothixene groups (P = 0.04). Pair wise comparison of groups for side-effects was carried out using Fisher exact test with adjusting of P value. The incidence of sedation in olanzapine group was significantly more than haloperidol group (P = 0.04). The weight gain in olanzapine group was significantly more than haloperidol and thiothixene groups (P = 0.04); Also it was more in atypical group (Olanzapine, Risperidone) than typical group (Haloperidol, Thiothixene), significantly (P = 0.035). Other side-effects were acute dystonia, akathisia, blurred vision, dry mouth, constipation and rash which did not differ significantly between groups. The results provide preliminary evidence that the mean time to first response was significantly shorter for risperidone, comparing to the three other drugs. The Zedkova study showed although the differences among drugs were not significant, but the typical antipsychotics have somehow faster onsets of action than atypical antipsychotic drugs. Our study performed on 15-60-year-old patients and only on 2 weeks, however Zedkova studied only adolescent patients. Lambert, in study of comparing risperidone with olanzapine in the treatment of the first episode of the affective psychosis showed somehow shorter time to reach the treatment response with olanzapine. This study was open and retrospective and the difference was not significant. Hence, we think our study showed a new significant finding in the velocity of action of the risperidone compared with the other antipsychotics and this must be trialed in future studies, more. Our study had some limitations, which must be considered before generalizing the findings. We compared only four antipsychotics in our study, although these are the most commonly used in our country and most of the other related studies compared less than these in one randomized controlled trial. The second limitation was in scoring the symptoms and response; we did these by only one scale. Comparing only ten patients in each group may somehow considered as another limitation. Briefly, we found that the mean time for reaching the first response in the treatment of psychosis with each of the typical or atypical antipsychotics is about 1 week and this was shorter with risperidone than with others. Considering side effects, the atypical antipsychotics caused more sedation and weight gain while in typicals haloperidol caused more EPS than others. Future trials with more antipsychotic, more patients, more scales and in other settings may guide the practitioners to more reliable conclusion. We like to express our gratitude to the emergency psychiatry service of Noor hospital collaborations and the Behavioral Sciences Research Center of Isfahan University of Medical Sciences (Isfahan, Iran) supports, which without their supports we could not do this study. Dr. Mousavi contributed in concepts, design and definition of intellectual content, literature search, data acquisition, manuscript preparation and review. Dr. Rostami contributed in concepts, design, definition of intellectual content, and data acquisition. Dr. Sharbafchi contributed in concepts, design and definition of intellectual content, literature search, manuscript preparation, and correspondence. Dr. Saeidi boroujeni contributed in concepts, design, definition of intellectual content and literature search. Dr. Mahaki contributed in concepts, design and definition of intellectual content, data analysis and statistical analysis. 1. Lewis S, Escalona PR, Keith SJ. Phenomenology of Schizophrenia. In: Sadock BJ, Sadock VA, Ruiz P, editors. Kaplan and Sadock′s Comprehensive Textbook of Psychiatry. 9 th ed. New York: Lippincott Williams and Wilkins; 2009. p. 1433-51. 2. Lieberman JA, Fenton WS. Delayed detection of psychosis: Causes, consequences, and effect on public health. Am J Psychiatry 2000;157:1727-30. 3. Fenton WS, Blyler CR, Heinssen RK. Determinants of medication compliance in schizophrenia: Empirical and clinical findings. Schizophr Bull 1997;23:637-51. 4. Malla A, Norman R, Schmitz N, Manchanda R, Béchard-Evans L, Takhar J, et al. Predictors of rate and time to remission in first-episode psychosis: A two-year outcome study. Psychol Med 2006;36:649-58. 5. Lieberman JA, Tollefson GD, Charles C, Zipursky R, Sharma T, Kahn RS, et al. Antipsychotic drug effects on brain morphology in first-episode psychosis. Arch Gen Psychiatry 2005;62:361-70. 6. Tohen M, Strakowski SM, Zarate C Jr, Hennen J, Stoll AL, Suppes T, et al. The McLean-Harvard first-episode project: 6-month symptomatic and functional outcome in affective and nonaffective psychosis. Biol Psychiatry 2000;48:467-76. 7. Robinson DG, Woerner MG, McMeniman M, Mendelowitz A, Bilder RM. Symptomatic and functional recovery from a first episode of schizophrenia or schizoaffective disorder. Am J Psychiatry 2004;161:473-9. 8. Bilder RM, Goldman RS, Robinson D, Reiter G, Bell L, Bates JA, et al. Neuropsychology of first-episode schizophrenia: Initial characterization and clinical correlates. Am J Psychiatry 2000;157:549-59. 9. Miyamoto S, Lieberman JA, Fleischhacker WW, Aoba A, Marder SR. Antipsychotic drugs. In: Tasman A, Kay J, Lieberman JA, editors. Psychiatry. 2 nd edition. Chichester: John Wiley and Sons, Ltd.; 2003. p. 1928-64. 10. Buckley PF. Broad therapeutic uses of atypical antipsychotic medications. Biol Psychiatry 2001;50:912-24. 11. Kane JM, Leucht S, Carpenter D, Docherty JP, Expert Consensus Panel for Optimizing Pharmacologic Treatment of Psychotic Disorders. The expert consensus guideline series. Optimizing pharmacologic treatment of psychotic disorders. Introduction: Methods, commentary, and summary. J Clin Psychiatry 2003;64 Suppl 12:5-19. 12. McEvoy JP, Scheifler PL, Frances A. The expert consensus guideline series: Treatment of schizophrenia. J Clin Psychiatry 1999;60:1-80. 13. Miyamoto S, Stroup TS, Duncan GE, Aoba A, Lieberman JA. Acute pharmacologic treatment of schizophrenia. In: Hirsch SR, Weinberger DR, editors. Schizophrenia. 2 nd ed. Oxford: Blackwell Science; 2003. p. 442-73. 14. Schooler N, Rabinowitz J, Davidson M, Emsley R, Harvey PD, Kopala L, et al. Risperidone and haloperidol in first-episode psychosis: A long-term randomized trial. Am J Psychiatry 2005;162:947-53. 15. Lieberman JA, Tollefson G, Tohen M, Green AI, Gur RE, Kahn R, et al. Comparative efficacy and safety of atypical and conventional antipsychotic drugs in first-episode psychosis: A randomized, double-blind trial of olanzapine versus haloperidol. Am J Psychiatry 2003;160:1396-404. 16. Emsley RA. Risperidone in the treatment of first-episode psychotic patients: A double-blind multicenter study. Risperidone Working Group. Schizophr Bull 1999;25:721-9. 17. Sanger TM, Lieberman JA, Tohen M, Grundy S, Beasley C Jr, Tollefson GD. Olanzapine versus haloperidol treatment in first-episode psychosis. Am J Psychiatry 1999;156:79-87. 18. Crespo-Facorro B, Pérez-Iglesias R, Ramirez-Bonilla M, Martínez-García O, Llorca J, Luis Vázquez-Barquero J. A practical clinical trial comparing haloperidol, risperidone, and olanzapine for the acute treatment of first-episode nonaffective psychosis. J Clin Psychiatry 2006;67:1511-21. 19. Remington G. Understanding antipsychotic "atypicality": A clinical and pharmacological moving target. J Psychiatry Neurosci 2003;28:275-84. 20. Lieberman JA, Stroup TS, McEvoy JP, Swartz MS, Rosenheck RA, Perkins DO, et al. Effectiveness of antipsychotic drugs in patients with chronic schizophrenia. N Engl J Med 2005;353:1209-23. 21. Kahn RS, Fleischhacker WW, Boter H, Davidson M, Vergouwe Y, Keet IP, et al. Effectiveness of antipsychotic drugs in first-episode schizophrenia and schizophreniform disorder: An open randomised clinical trial. Lancet 2008;371:1085-97. 22. McEvoy JP, Lieberman JA, Perkins DO, Hamer RM, Gu H, Lazarus A, et al. Efficacy and tolerability of olanzapine, quetiapine, and risperidone in the treatment of early psychosis: A randomized, double-blind 52-week comparison. Am J Psychiatry 2007;164:1050-60. 23. Salimi K, Jarskog LF, Lieberman JA. Antipsychotic drugs for first-episode schizophrenia: A comparative review. CNS Drugs 2009;23:837-55. 24. Agid O, Seeman P, Kapur S. The "delayed onset" of antipsychotic action - An idea whose time has come and gone. J Psychiatry Neurosci 2006;31:93-100. 25. Kane JM, Stroup TS, Marder SR. Schizophrenia: Pharmacological treatment. In: Sadock BJ, Sadock VA, Ruiz P, editors. Kaplan and Sadock′s Comprehensive Textbook of Psychiatry. 9 th ed. New York: Lippincott Williams and Wilkins; 2009. p. 1547-56.28. 26. Nordström AL, Farde L, Halldin C. Time course of D2-dopamine receptor occupancy examined by PET after single oral doses of haloperidol. Psychopharmacology (Berl) 1992;106:433-8. 27. Tauscher J, Jones C, Remington G, Zipursky RB, Kapur S. Significant dissociation of brain and plasma kinetics with antipsychotics. Mol Psychiatry 2002;7:317-21. 28. Lambert M, Conus P, Schimmelmann BG, Eide P, Ward J, Yuen H, et al. Comparison of olanzapine and risperidone in 367 first-episode patients with non-affective or affective psychosis: Results of an open retrospective medical record study. Pharmacopsychiatry 2005;38:206-13. 29. Addington DE, Pantelis C, Dineen M, Benattia I, Romano SJ. Efficacy and tolerability of ziprasidone versus risperidone in patients with acute exacerbation of schizophrenia or schizoaffective disorder: An 8-week, double-blind, multicenter trial. J Clin Psychiatry 2004;65:1624-33. 30. Kapur S, Arenovich T, Agid O, Zipursky R, Lindborg S, Jones B. Evidence for onset of antipsychotic effects within the first 24 hours of treatment. Am J Psychiatry 2005;162:939-46. 31. Brook S, Lucey JV, Gunn KP. Intramuscular ziprasidone compared with intramuscular haloperidol in the treatment of acute psychosis. Ziprasidone I.M. Study Group. J Clin Psychiatry 2000;61:933-41. 32. Zedkova I, Dudova I, Urbanek T, Hrdlicka M. Onset of action of atypical and typical antipsychotics in the treatment of adolescent schizophrenic psychoses. Neuro Endocrinol Lett 2011;32:667-70. 33. Kay SR, Fiszbein A, Opler LA. The positive and negative syndrome scale (PANSS) for schizophrenia. Schizophr Bull 1987;13:261-76. 34. van Kammen DP, Hurford I, Marder SR. First-generation antipsychotics. In: Sadock BJ, Sadock VA, Ruiz P, editors. Kaplan and Sadock′s Comprehensive Textbook of Psychiatry. 9 th ed. New York: Lippincott Williams and Wilkins; 2009. p. 3105-27. 35. Kay SR, Opler LA, Lindenmayer JP. Reliability and validity of the positive and negative syndrome scale for schizophrenics. Psychiatry Res 1988;23:99-110. 36. World Health Organization. Process of translation and adaptation of instruments. Available from: http://www.who.int/substance_abuse/research_tools/translation/en/. [Last accessed on 2013 Dec 11]. 37. Munetz MR, Benjamin S. How to examine patients using the abnormal involuntary movement scale. Hosp Community Psychiatry 1988;39:1172-7. 38. Lim HK, Kim JJ, Pae CU, Lee CU, Lee C, Paik IH. Comparison of risperidone orodispersible tablet and intramuscular haloperidol in the treatment of acute psychotic agitation: A randomized open, prospective study. Neuropsychobiology 2010;62:81-6. 39. Sikich L, Hamer RM, Bashford RA, Sheitman BB, Lieberman JA. A pilot study of risperidone, olanzapine, and haloperidol in psychotic youth: A double-blind, randomized, 8-week trial. Neuropsychopharmacology 2004;29:133-45. 40. Möller HJ, Riedel M, Jäger M, Wickelmaier F, Maier W, Kühn KU, et al. 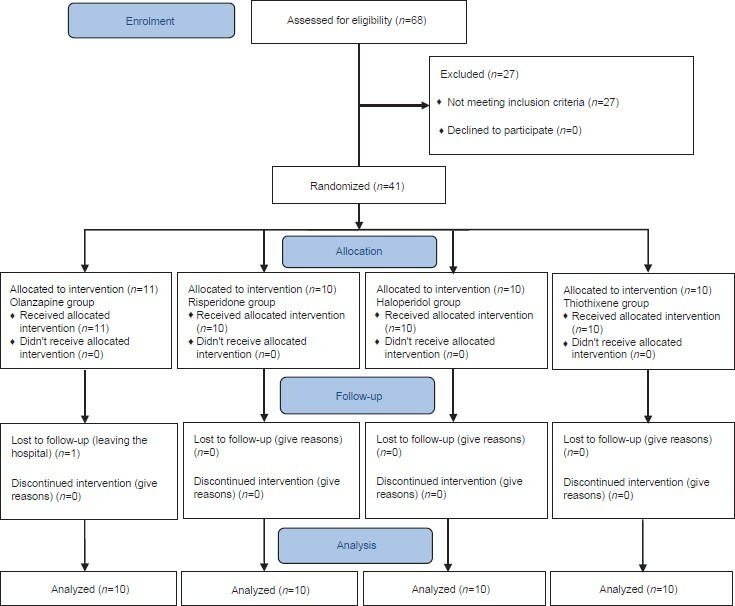 Short-term treatment with risperidone or haloperidol in first-episode schizophrenia: 8-week results of a randomized controlled trial within the German Research Network on Schizophrenia. Int J Neuropsychopharmacol 2008;11:985-97.